We hear it every year: Post position one is the kiss of death in the Kentucky Derby — the equivalent of Samuel Taylor Coleridge's albatross, Edgar Alan Poe’s raven or a movie that includes “directed by Michael Bay” in the opening credits. When Lookin At Lucky drew the rail in the 2010 Run for the Roses, trainer Bob Baffert looked like he’d been punched in the stomach… and then kicked in the groin. The post one pity party continued in 2011. “Not a good place to be,” noted trainer William “Jinks” Fires after his horse (Archarcharch) was assigned the first spot in the Derby starting gate last year. “I’ve never liked the one hole, but you got to do what you got to do. “We’d like to lay just off the pace and with the one hole if you don’t go with them a ways you’ll get shuffled way back,” said Fires, whose colt had rallied from ninth — of 13 — at the first call in its final Kentucky Derby prep, the Arkansas Derby. If you ask me (and if you didn’t, please just pretend you did) all this railing about the rail is silly. Simply put, there is no such thing as a post-one bias in the Kentucky Derby — it’s the tooth fairy, Santa Claus and a thought-provoking episode of the “Maury Show” all rolled into one. Let me quit clapping for a moment and add that a host of other data I’ve gathered backs up Moss’ contention that the one hole is not instant Derby death. Notice that, not only does the number one post position have a positive impact value — a ratio popularized by Dr. William Quirin that measures actual wins in relation to expected wins (in this case, the success rate divided by the par) — but the ROI is better than average as well. I know what some of you are thinking: Well, sure Derek, that’s overall. The real problem with breaking from the rail is when there are a lot of Derby entrants and the auxiliary gate is used. In those cases, the horse stuck in the one hole needs to veer right at the start in order to avoid hitting the inner rail, which inevitably leads to bumping and herding… and a rotten trip. Talk about things that make you go hmm: check out that impact value. Far from being a disadvantage, the numbers indicate that breaking from the rail when the auxiliary gate is used is actually a major plus. Aah, but once again I hear the cries of dissent. 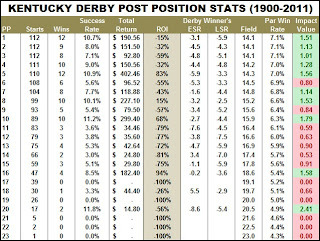 Why winning the Derby from post one — on the same track (Churchill Downs has changed little over the years), under the same circumstances (the race conditions, distance and starting point have remained consistent for decades) — would be a Herculean feat now when it wasn’t in the recent past eludes me, but I’ll play along. Here for the first time we see a subpar impact value, yet the ROI is still very strong, comparatively speaking. What's more, 27 test cases is hardly enough data on which to base a solid conclusion, especially since the expected win rate for each post is only about five percent. So, after next week’s Derby draw, when the inevitable crying and moaning about the one hole begins in earnest, remember these statistics. 2012 Kentucky Derby Betting Guide Now Available! I’m pleased to announce that "Derek Simon's 2012 Kentucky Derby Betting Guide" is now available for purchase through Brisnet.com. * Pro-and-con analysis of all the likely Derby entrants. 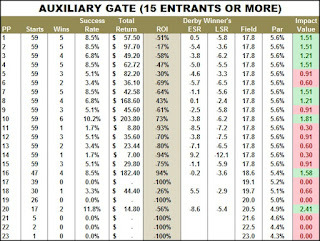 * A look at the breeding of the major contenders, including a unique pedigree angle that tabbed Mine That Bird ($103.20) in 2009. * A surprising answer as to what kind of prep races produce the best Derby ROI. * Statistics and betting tidbits galore, including this gem: Since 1992, Derby entrants that recorded a “poor” LSR (-15 or less) in their final prep are 1-for-86 with a -40.0 percent ROI on the first Saturday in May (this year’s qualifiers are identified in the Guide). * Betting angles, including one that has produced an ROI of 87% since 1992 and another that has a 62% ROI since ’92. Click HERE to get your Guide today… or tomorrow… or any time prior to the Derby. Doesn't the 1982 chart say it all? If there are 20 horses in the gate then the one hole is a tremendous handicap. It's INSIDE the inside rail. Yes, there might be some melodrama involved in how much it impacts a horse and what affect it should have on a horse's price (especially depending on other variables like his running style and who is to his outside), but it's absolutely a terrible draw. 1982: "1-CUPECOY’S JOY set the pace in comfortable fashion into the stretch before giving way." "17-DON’T GET MAD settled eight wide early, edged in on the first turn, raced four wide on the backstretch, was asked for his best nearing the three-eighths pole while circling foes eight wide, came to the extreme outside to be ten wide entering the stretch, offered a serious bid entering the final furlong but couldn’t sustain the needed momentum." Now, I ask you: Would you rather see your horse get the trip that Cupecoy's Joy did from the rail in 1982 or the trip that Don't Get Mad got from post no. 17 in 2005? And, in my opinion, a horse is far more likely to get a horrendous trip like Don't Get Mad got on the outside than on the inside, including the rail. I think the stats bear that out. While the one post is, on average, a good post it is also a "dangerous" post. It can lead to nightmare trips - aka Archarcharch and Lookin' At Lucky. So, all things being considered, I'd rather not draw it. I don't like post one. If you use a sample of one, in 2011, a horse is likely to sustain an injury from that post, despite getting a great trip. I hope nobody draws it this year; as Derek shows, they clearly should scratch it's so bad. Maybe they should just start at "two" and do what buildings do with the 13th floor. Here's the thing, though, Kyle: Archarcharch was just one of 5 horses — I counted 'em, LOL — that received a chart comment relating to steadying, interference or a poor start. And that's just one person's (or a small team's) opinion. I also have a hunch that certain horses, i.e. the race favorites, and certain posts, i.e. post one, are watched more closely in the first place. Plus, it doesn't take into account all the horses that went tremendously wide. Whereas, steadying costs a horse an indeterminate number of lengths, the effect of a wide trip can be mathematically computed and I would venture that the effect is often greater than what a slight check or steadying — at the start of the race, in most cases — costs some of the inside horses. And that’s if such incidents occur at all. Last year, Dialed In, who broke from the eight hole (which has a 2.02 impact value in large fields over the past 30 years) got the very worst of it at the break, as did Derby Kitten, who broke from post nine. PTP, I never said post one was terrible; quite the contrary, in fact. However, I do agree with you that a simple solution to this, given that so many people fret about the rail being slightly inside the gate, is to move all the horses out one position. We know the track can handle it — Churchill Downs accommodated 23 horses in the ’74 Derby (which is why the limit is 20 today, LOL). PS: Arch was steadied a bit (who isn't in the Derby? ), but he got a nice inside run in the first quarter thereafter, and was in the 2 and a half path about three or four behind the winner, with zero traffic (in a 25 and change second panel to boot). If he didn't have a broken leg, he might have been on the winners flank past the 5/8's, having a big shot to win. Hardly a bad trip in a 20 horse field, IMO. Sorry, PTP. I've been shocked by some of the crazy conclusions people -- like my kids, for example (LOL) -- have drawn from what I've said/written, so I didn't catch the cheekiness. Now that I view it in that light, this line cracks me up: "If you use a sample of one, in 2011, a horse is likely to sustain an injury from that post, despite getting a great trip." Ha, ha. That's good stuff! It's funny to me. I feel in 50 years people will be calling the 20 post (rightfully) a death post, because we'll see a dozen or so Sidney's Candy type moves from there. But with Big Brown fresh in our minds, it's kind of an afterthought. It doesn't matter that he was so much better than the field at 10f, he could've started in the infield and won. Boy, you nailed it with Sidney's Candy -- now there's a horse that had limited (and generally poor) options. Heck, look at that second table and notice all the red (impact values less than 1.00) for the outside posts in general. So according to Randy Moss, if you watch the replays of recent Derbies, "you won't see meaningful early trouble for any of those rail-drawn horses." Well I watched them all and it is very obvious how difficult it is to get a good start from post 1. In fact, post 2 isn't much better. Unlike the other posts, the inside horse can't run a straight line to the rail. The jockey must maneuver the horse to the right and will, nearly always, bump into the post 2 horse or take back so as not to get in a jam when he approaches the rail. Not only hasn't a post 1 horse won the Derby since Ferdinand, but only Risen Star in 1988 finished in the money (3rd) since then. Post 1 is death (or at least a near death experience). Don't mean to interrupt the love fest between Derek and PtP, but I still don't understand how stats from years where there aren't 20 in the gate(s) has any bearing on the performance of rail horses when there is a full field (i.e., 20 in the gates). We're all smart enough to know that trouble can occur from any post, etc., but to suggest that the position of the one hole inside the inside rail is not the worst place to be on anything but a dead closer just doesn't make sense to me. If you're argument is, "It's not THAT bad, and if you like a horse you still should play him--especially since you might have gotten an extra odds point or two" then fine, I can dig on that. But your argument seems to be, "The one is just as good (if not better?!!) than any other post", and that makes no sense. "Don't mean to interrupt the love fest between Derek and PtP." LOL. Ed, since 1900 there have been 17 Derbies with 20 or more horses... 17! Ask a statistician, mathematician or, frankly, anybody whose studied statistics and they will tell you that you can’t draw conclusions on a 5% probability event from just 17 test cases. Well, guess what? Even though it doesn’t mean anything, post one has produced one Derby winner in a field of 20 horses or greater — so it has outperformed the expected norm. 1) Take 20 cards from a standard 52-card deck. 2) Shuffle the 20 cards. 3) Draw three cards (from the 20) and record the results. Consider the first card drawn to be the winner, the second card drawn to be second and the third card to be third. Record the results. 4) Repeat steps two and three 16 times. It is my prediction that at least three cards will NOT be drawn to win, three will NOT be second and three will NOT be third. In fact, it is likely that more than three will be blanked in EACH slot, thereby proving the jinx. Hopefully folks see how crazy this example is, yet that’s exactly what many people are doing in regard to 20-horse fields and the no. 1 post position. As for the argument that the rail jumps cuts off the no. 1 horse, I will address that (briefly) next week. Derek, I wasn't presenting those facts as "proof." My point was related to watching the starts of recent derbies (1995-2011) and the visual evidence of horses from the inner post having considerable trouble out of the gate. Randy Moss, in your article, saw no meaningful trouble in the video replays. I look forward to you addressing this (briefly) next week. I forgot to mention . . . You said that post 1 "has outperformed the expected norm." Ferdinand in 1986 was the only winner from post 1 in about 47 years. And I don't see how the 20-horse field enter the argument, as you would think that it would be easier to win in the smaller fields--but post 1 horses haven't won in big AND small fields in, I repeat, 46 of the last 47 years. Anonymous (call me cynical but I don't think that's your real name, LOL), I said post no. 1 outperformed the expected norm in fields of 20 horses or more (1-for-17). And that was in response to Ed's comments. Look, what all this demonstrates to me is that a lot of people don't really understand statistics very well. 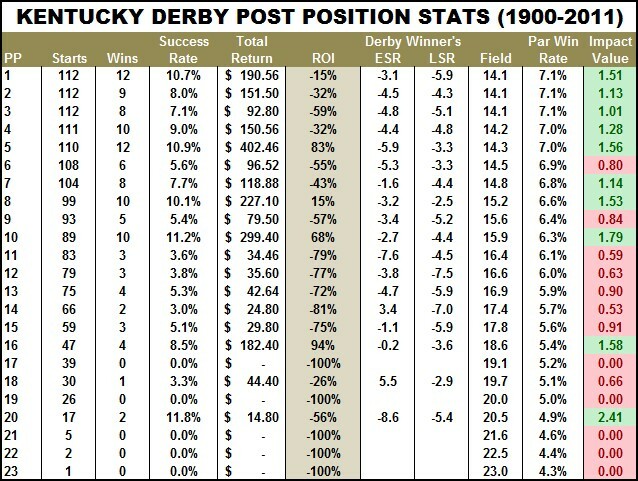 Since 1986, the Derby field has averaged 17.6 starters, which means the average horse has a 5.7% chance of winning. Hence, the chance of a post losing 25 consecutive times — as post one has — is 23.2%. In other words, it is FOUR TIMES MORE likely for a single post position to show 25 consecutive losses than it is for a single post position to WIN. Think about that. 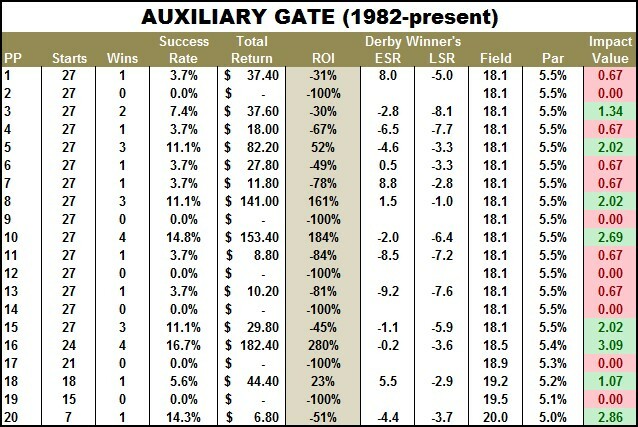 So, when people bring up facts like "no horse has won from the rail since '86" I say, so what? It's just not very meaningful given the low chance of success to begin with. Plus, Randy Moss showed that rail horses had actually outrun their odds (using the odds is probably the best way to determine expectations). Next week, I'll add more data to the pot... and we can all continue to argue (LOL). On a serious note, I really appreciate the comments and, as I've said before, I think such debates — when they focus on the subject at hand and don't get personal — are constructive and kind of fun. So thanks to all those who've weighed in thus far. I'm still waiting for clarification on what the thesis is. Ed...will u change ur mind on this topic as easily as u JUMPED off I'll have another!! So fickle!! Derek rocks, don't argue with him. I'm changing my "handle" because this other "Anonymous" can't spell. LOL. Derek, quit confusing me with the facts! I hope you're looking at the replays in advance of your comments next week. The answer is A, Ed. The other Anonymous is using "text spell" (as archeologists will undoubtedly call it one day), Roy, and his/her “Derek rocks” comment convinces me that he/she is a person of great intelligence and integrity (LOL). By the way, I will watch the replays. I’ve seen two — 2011 and 2008 — and there were no incidents, but I haven’t seen the others. Ed I wonder how 0 for 17 is a handicap. In a field of 20 horses with winners perfectly distributed there would be 3 post positions with no winners. That's right, Ed, and 1-for-17 is above expectations. That's the point I think many people are missing — we are talking about a 5-6% success rate. So stats that we would normally consider to be terrible really aren't. That said, 17 test cases aren't enough to draw any meaningful conclusions — one way or the other. Anonymous, makes the point that I tried to make with my "card game." Again, we are dealing with a very low probability of success to begin with. Assuming exactly 20 horses start every year, the chance of any one post position getting blanked for 17 years is a whopping 41.8%. I hate to beat a dead . . . uh, well you know, but why the focus on just the 20-horse fields. A smaller field will result in the post 1 horse in a stall further away from the rail (i.e., the imaginary line from gate to the approach to the rail), and less trouble encountered in a smaller field, too. It's not as though post 1 wins in a small field as opposed to a large field, or vice versa. Post 1 doesn't win in either circumstance. So I'm sticking with my original posting (as the proper-spelling "anonymous" LOL) that the videos show what the stats don't, but if you're looking at stats you need to look at all size fields. One winner from post 1 since 1963. I'll stop until Derek rocks with his comments next week. No post position has produced more Kentucky Derby winners than the rail, yet when there are 20 in the gate it's only 1/17. Reads to me like a full field dulls that position. Does a rail draw mean you can't win? Of course not. Horses overcome all sorts of trouble and still win races--e.g., going to your kness turning for home in the Preakness is probably a long-term loser, but it "worked" for Afleet Alex. Still, it's not ideal. Since you feel the stats are meaningful, Ed, AND that they suggest horses breaking from post 1 are at a disadvantage, I am left to assume that you would have required at least 2 wins over those 17 years to be otherwise convinced. But this is unlikely: there is only about a 20.8% chance. Indeed, it is TWICE as likely that post 1 is as good as any other post and no wins are recorded over that time period. In other words, the stats don't make for a compelling argument. If anything, though, the data argues (whispers really) against post 1 being somehow worse than normal. So what if we assume post 1 really is awful? What if we say that horses breaking from post 1 should win only 1% and not the 5% they otherwise would. In this case, there is an 84.3% chance they would record no wins over 17 years and only a 14.5% chance of recording 1 win. So in this case, too, the data works against the argument that the rail is "dull" somewhat. If our hypothesis is true, that 1 win is a bit unlikely. 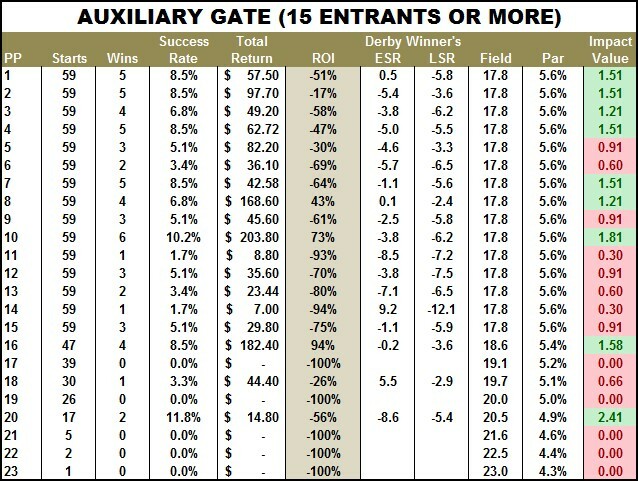 BTW, I thought they generally positioned the gate in the same place regardless of field size except (perhaps) when the auxiliary gate is added-- which ought to make the magic number 16 or more horses, no? Why does 20 horses push the 1 hole closer to the rail and not 16, 17, 18, and 19?